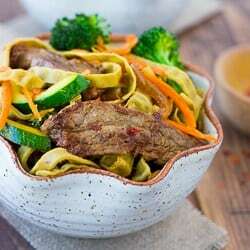 30-Minute Beef Stroganoff! Comforting, savory and made gluten/dairy-free with REAL ingredients! One of the questions I get a lot is if my kids and husband eat gluten-free with me too. The answer is mostly yes – at home we are 100% gluten-free. If we go out to eat sometimes my husband will get a burrito and I’ll get a salad or something to that effect. And my son has the occasional slice of Costco pizza or sandwich with Grandpa. But at home we are totally gluten-free and I’d like to think they don’t even notice! One of my goals with my blog is to share things I’ve made that my whole family likes. So you’re not stuck in the kitchen for hours making separate “regular” meals and allergy-free meals. 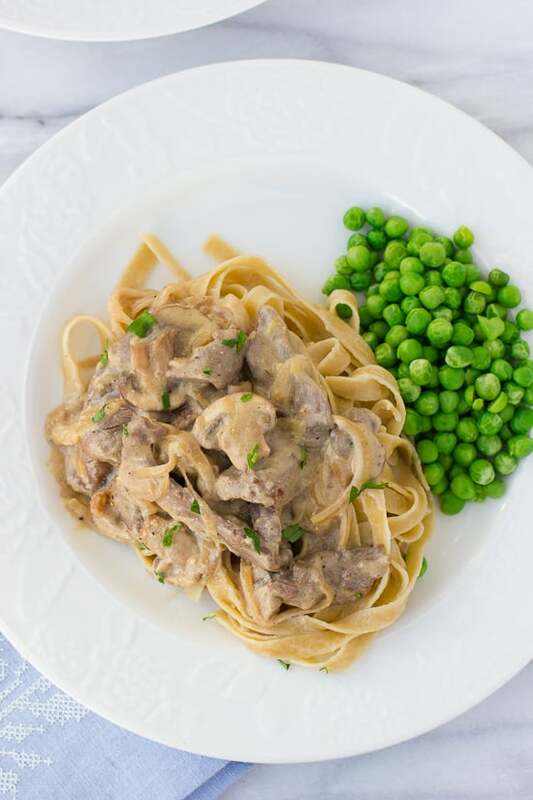 I love delicious, easy dinners like this 30-minute beef stroganoff to get dinner on the table. 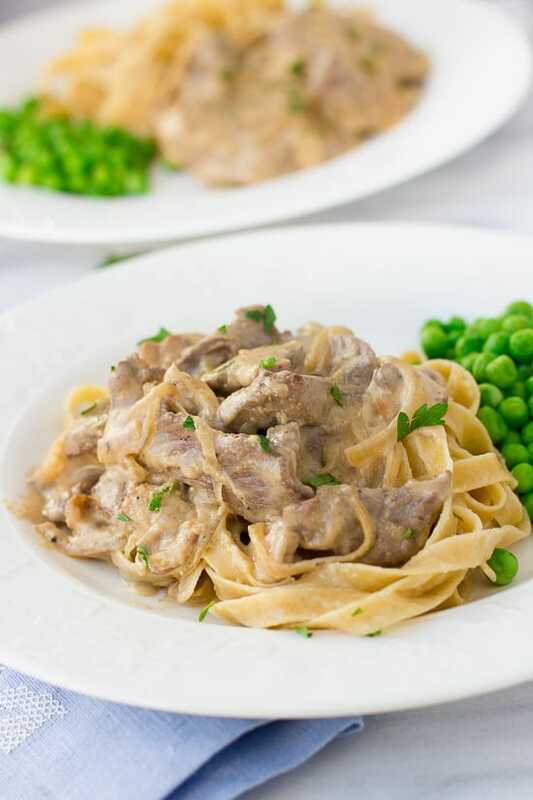 Beef stroganoff might not win any gourmet points, but it’s a meal that leaves everyone feeling happy and satisfied. I make beef stroganoff with cashew cream instead of the sour cream. I was skeptical about cashew cream replacing dairy awhile back, but trust me when I say you won’t even notice! If you can eat dairy, you can definitely use regular sour cream. I like serving this over Jovial gluten-free egg noodles or rice. I don’t drink wine, but I cook with it so I buy it in those small picnic bottles for recipes like this. 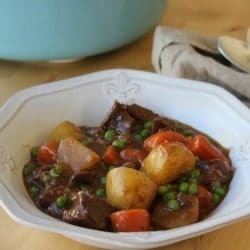 If you prefer, you can substitute more beef broth. This recipe is great with thinly sliced steak or ground beef. Even though the steak version is fancier, I secretly like the ground beef version best! Use olive oil or avocado oil to keep this totally dairy-free. I can eat some butter so I use butter and the lemon cashew cream. You’ll never guess this is dairy-free! If you don’t have a very powerful blender you might want to soak the cashews in hot water before blending them up. Be sure to use gluten-free Worcestershire sauce. Any gluten-free all-purpose flour should work here. I use Bob’s Red Mill. Heat the butter in a large saute pan over medium-high heat. Add the beef in an even layer, season generously with salt and pepper and let cook without moving for 3-4 minutes to get a nice sear. Stir and cook on the other side for another 2-3 minutes.Transfer to a plate. If using ground beef, spread the beef into an even layer then season with salt and pepper. Use a spatula or wooden spoon to break up the beef and cook until no longer pink. Transfer to a plate. Add the onion, and a little more butter if needed to the now empty pan. Cook on medium heat until softened, about 6-8 minutes. Add the mushrooms and cook until softened, another 6-8 minutes. Add the garlic and cook for 30 seconds until fragrant. Meanwhile, place all the ingredients for the cashew cream in a blender and blend until smooth. Sprinkle the gluten-free flour over the onion/mushroom mixture and stir to cook for a minute or so to get rid of the raw flour flavor. Increase the heat and add the wine, stirring until smooth and scraping up the bottom of the pan. Cook for 2-3 minutes until the wine is slightly reduced. Slowly add the beef broth, whisking/stirring until smooth and let simmer for 5 minutes or so. Stir in the cashew cream and heat through. Add the parsley and season to taste with salt/pepper. Serve over gluten-free egg noodles or rice. Enjoy! This is where notes go. I completely agree with what you said about eating 100% gluten free at home. My husband is not DF and GF like I am but we make some pretty rockin’ meals (thanks in part to your rockin’ recipes) but when we go out he eats as much gluten and dairy as he wants! It was an agreement we made to not make 2 different meals at home and for him to also support me in my life change. It’s been such a game changer for me. DF and GF for 3 years now and loving it! Thanks for all your personal input and your amazing recipes! You’ve been a God send for sure. I will most assuredly be doing this recipe because this is the stuff I grew up on and kinda surrender the idea that I could eat something like this again. Thanks for the recipe! I trust you so I’m excited to try it! and PS- CASHEW CREAM is the BEST!!! and I like the ground beef version too. Growing up, steak was too expensive so ground turkey was what we had. I used 1/2 cup coconut milk (full fat) in place of the cashews and it tastes great! 🙂 Added bonus is you don’t have to use a blender. Hello I was wondering if you could suggest a subsitute for Worcestershire sauce since most or not gluten free. I use lea and perrins worcestershire sauce – it is gluten-free! How to make without cashews? hello!! do you need to soak the cashews to make the cream? or just blend the cashews raw with the broth? You definitely need to soak them, otherwise you end up with a nutty stroganoff. This was my experience tonight. I’ll definitely soak the cashews overnight next time. Instead of the cashew cream, I use cashew yogurt. It tastes delicious! I made this and it was delicious. I plan on making it many times. I made sure to save the post. Thank you. This is such a cozy meal! My whole family loves it. When does the meat go back in? Great smooth recipe. I found your recipe after finding “Beef Stroganoff” on Simply Recipes. Sort of combined parts of both. Much better tasting than from box mixes gluten free – and fresher with fresh ingredients. Thank you!